LED technology in a classic candle shape. A great feature for any chandelier - the clear lens adds a wonderful sparkle. 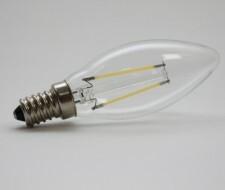 Direct replacement for a 32W incandescent, E14 screw base. 2800K warm white.